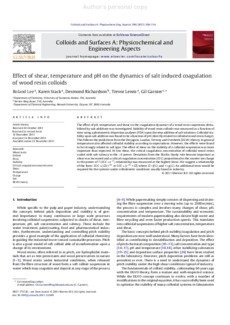 The effect of pH, temperature and shear on the coagulation dynamics of a wood resin suspension destabilized by salt additions was investigated. Stability of wood resin colloids was measured as a function of time using a photometric dispersion analyser (PDA) upon the step addition of salt solutions. Colloidal stability upon salt addition was found to be a function of pH (directly related to colloidal wood resin charge). This follows the predictions from the Derjaguin, Landau, Verwey and Overbeek (DLVO) theory. In general temperature also affected colloidal stability according to expectations. However, the effects were found to be strongly related to salt type. The effect of shear on the stability of a colloidal suspension was more important than expected. At low shear, the critical coagulation concentration of colloidal wood resins scaled with salt valency to the −6 power. Deviations from the Shultz–Hardy rule become important as shear was increased and a critical coagulation concentration (CCC) proportional to the counter ion charge to the power of 7 (CCC ∝ z−7) relationship was measured at the highest shear. We suggest a relationship of the form: CCC ∝ (Ωz)−6τ or CCC ∝ [z−6τ + Ω] where Ω = f(G) and τ = g(G). An additional term would be required for the systems under orthokinetic conditions usually found in industry.